New York Cheesecake with an Edge, Vermont Va Va Voom, Toast to the Coast and Southern Belle promise scintilating flavours that leave me unsure whether I should be slathering them on my body or on my crumpets in the morning! I’m gonna go with ‘body’… but only ‘cos I’m on a diet. The Body America range of products has been notoriously hard to track down until House of Fraser scooped them up as part of their new Apothecary setup. The range claims 72% organics which are enriched with Aloe Vera juice to soothe and soften the skin. That’s all great in theory… but how does the range really perform? Green Apple, Maple and Blueberry… but particularly heavy on the apple. Thankfully, although heady in combination, the scent that’s left behind on the skin is quite light and pleasantly fresh. I’m not usually a fan of products that foam before I get them close to my body as I find I have to use a ton to get the same kind of luxurious lather as with normal soapy formulas. This one gets a thumbs up for managing to go the distance before losing it’s fluff! I should also note that I didn’t find this drying on my skin. All style and no substance. It smells delicious (Ocean and Grapeseed), tastes incredible but does nothing to moisturise my lips. It’s thin and spreads lightly which makes it a nice butter to apply under a drying lipstick but that’s about as far as my praise for this one can stretch. My pick of the bunch and I will definitely be picking this up in the Toast to the Coast flavour. It’s a milky thin fluid that spreads for miles and contains minute particles of ‘scrub’. Touted as a light exfoliation, I’d say that on my skin it felt pretty full on and in my opinion, too harsh for the face. But it’s perfect for bodycare and leaves a positively edible scent behind! I haven’t tried any of the body butters but they’re reportedly made by the people behind The Body Shop body butters and only £7/£8 each. All products are available instore and online. 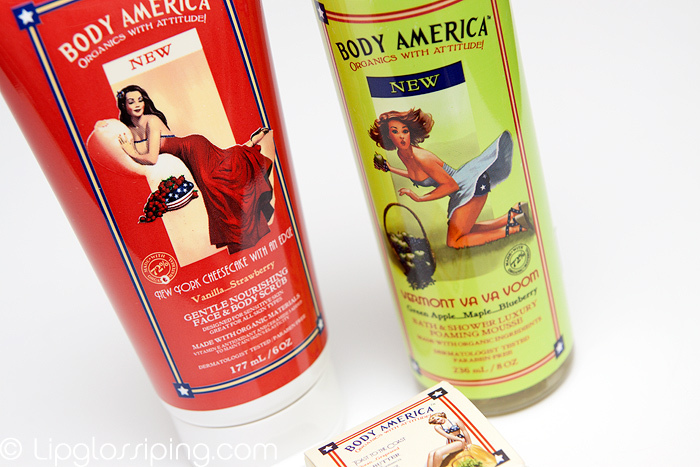 Have you tried the Body America range yet? Oh I saw these when I was out yesterday and was drawn in by the cute packaging. I’m glad I didn’t get any though as they don’t seem like they are worth the money as I like my scrubs to be very heavy duty. I think I’m going to check out etsy for some body cream that smells like cupcakes. I’ve become obsessed with etsy and cupcakes recently! I have tried the NY Cheesecake Body Butter and that was way too greasy for me. A shame really as I loved the smell. I’ve never heard of these products before. Very interesting! Did someone say Body Scrub??? I work right across the street from HoF so I shall be investigating thanks!